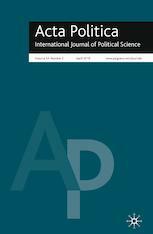 This journal is one of the few truly international political science journals with a broad scope across the discipline. As the official journal of the Dutch Political Science Association (Nederlandse Kring voor de Wetenschap der Politiek) it covers such sub-areas as Dutch and comparative politics, as well as international relations, political theory, public administration and political communication. In times of growing specialization in political science, this broad-ranging journal serves a vital role for the international research community. Set out to attract a wide audience with the ample range of political topics, it publishes a multitude of articles with a substantive theoretical background that demonstrate at the same time, how these ideas can be used empirically. While in the past most research tended to come from Europe, the journal now attracts more and more articles from the United States, Canada, and the world at large. Readers will find contributions that reach from theoretical and empirical articles over comparative and single-country studies to methodological notes. Also included are empirical articles which introduce new ways to incorporate or test theoretical discussions. The journal is committed to publishing research with an edge, bringing new insights and new approaches to political science.